The DW089K laser level from DeWalt is their mid-sized offering, which upgrades the beam strength and adds an additional two laser emitters when compared to the DeWalt DW087K. 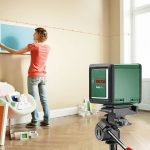 This laser level is perfect for tasks that demand accurate 90-degree angles, like hanging sheathing and drywall, flooring, and masonry work. The DeWalt DW089K Laser level also excels at shooting a horizontal line which makes installing trim and hanging cabinets a breeze. With an indoor range of 100’ and 50’ in bright daylight, the DeWalt DW089K Laser level features an extremely strong and bright class II laser emitter. It’s mounted in such a way that it can throw a 90-degree angle along with an additional horizontal line. 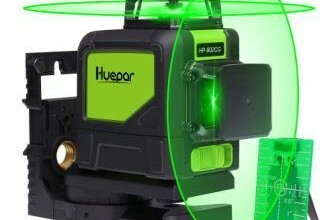 The self leveling laser is powerful enough to be seen in broad daylight while still being safe to use without protective glasses, so it’s a convenient option both at home and on the job site. One of the biggest upgrades made to the DeWalt DW089K Laser leveler is in its calibration and line adjustment. With just the turn of a knob, you can quickly calibrate the laser line to be perfectly level out to whatever distance you require. In addition to easy calibration, the DeWalt DW089K self leveling laser also makes it simple to adjust the laser vertically without the need to move the entire unit. If your line is too low, it’s as easy to fix as turning a knob. The DeWalt DW089K features a metal cage for the laser emitter head, making it incredibly durable and difficult to damage. 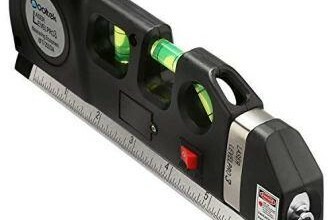 If you’re using this laser level professionally, you can rest assured that even if it gets banged up on the job site it will keep running. In addition to the design of the outer case and cage, the DeWalt DW089K Laser level includes a high-impact plastic case for storage and transportation. Especially considering that the DeWalt DW089K Laser level uses four AA batteries for power, it will keep running for a very long time. Even with all three lasers active, you can expect a battery life of over 30 hours. 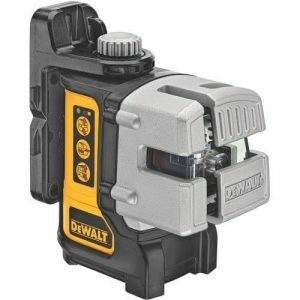 DeWalt has been able to keep the price low by removing the need for a charger and battery packs by improving the laser emitter to use less electricity while still remaining bright and easy to see. Like the less expensive DeWalt DW087K, this laser level lacks a pendulum lock. That means that during transportation the delicate mechanism that the laser emitter is mounted on can get knocked around, throwing it out of calibration. For best results, calibrate the DeWalt DW089K self leveling laser every time you set it up. While it won’t need re-calibration as you move it around your work area, trips in the truck or long periods of storage will throw the laser off. Although it’s less of an issue than the need for constant re-calibration, the mounting clamp of the DeWalt DW089K suffers from the same problems of the DW087K. 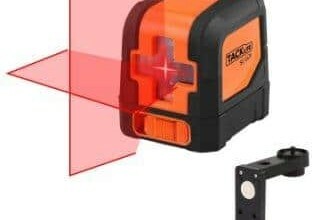 Its jaws just don’t open as wide as they could, making magnetic mounting the best choice for this laser level. If you need to be able to mount the DeWalt DW089K Laser level to a thicker surface like a 2×4, you’ll need to make a jig and use a clamp. Finally, the DeWalt DW089K Laser leveler would really benefit from having a tripod included in this package. The magnetic mount is flexible and easy to use, but it’s not suitable for every job. Especially during work outdoors, you’ll miss the ability to easily move the DeWalt DW089K around. Fortunately, DeWalt includes a threaded accessory attachment on the base of the level, so if you purchase a tripod separately this level will work with it. The DeWalt DW089K Laser level addresses some of the issues of its less expensive brother and includes a few features, like a 90-degree beam and support for a tripod, which professionals will really appreciate. 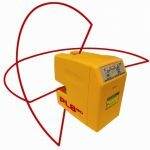 While it’s not an industrial-grade laser level, it is extremely portable and easy to use. Whether you’re tackling a big home improvement project or you work professionally in the trades, the DeWalt DW089K is a great investment that will save you time and make tedious work just a little bit easier.